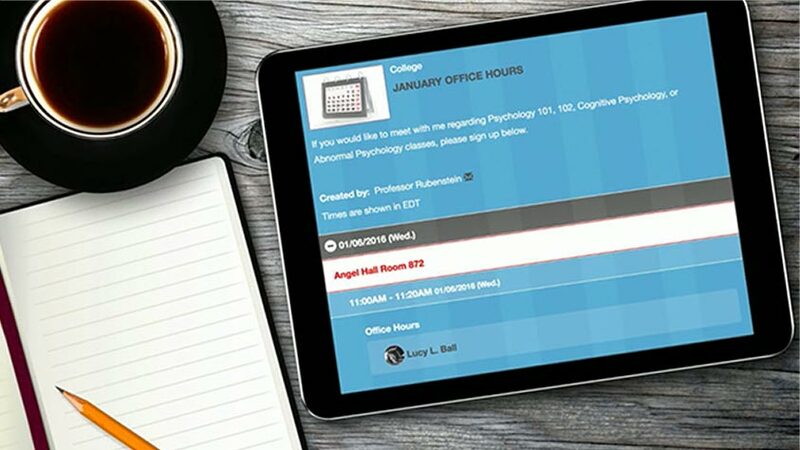 Plan College Activities and Events Easily! 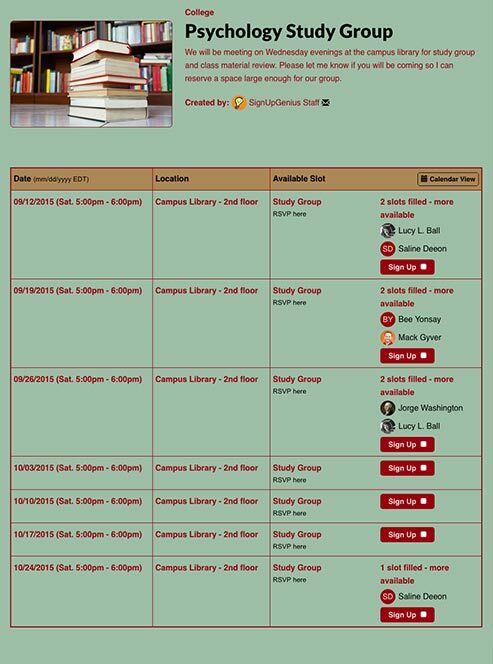 Organize study sessions, office hours, college fundraisers and community service opportunities with online sign up forms. 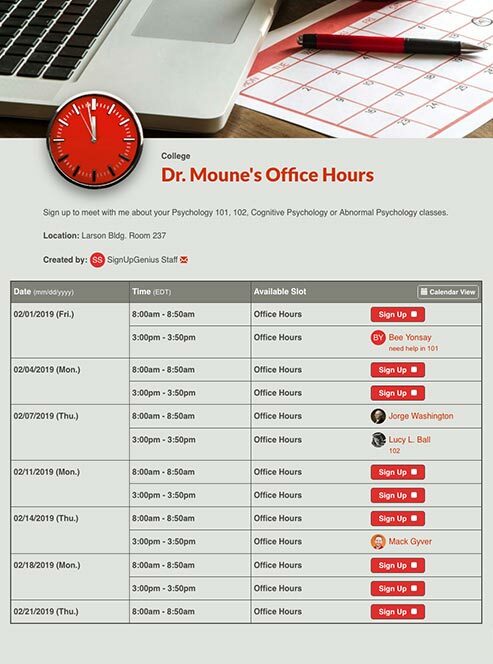 Organize professor and TA office hours or schedule student class presentations. Plan student study groups and tutoring sessions to coordinate exam prep and snacks. 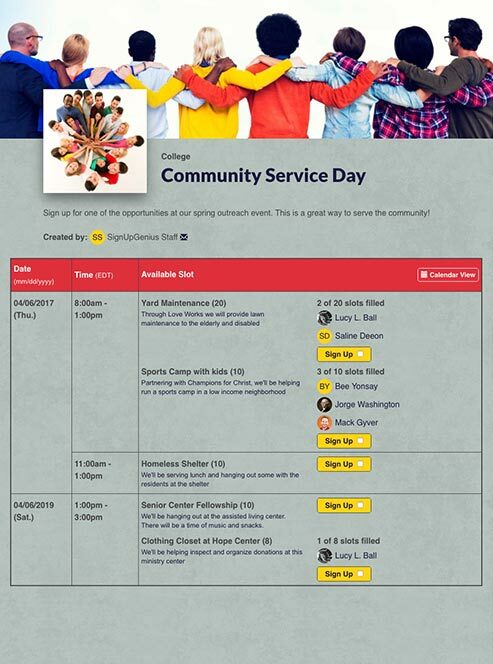 Plan service projects for students to get involved with nonprofits and community causes. 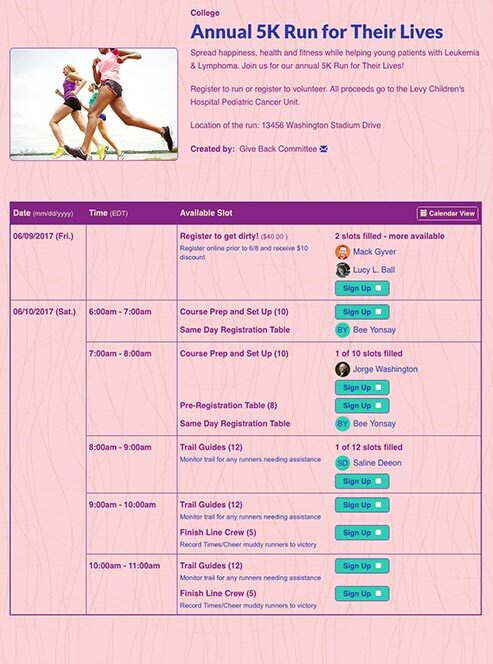 Coordinate college fundraisers and 5K races. Plus, collect online payments/registrations. 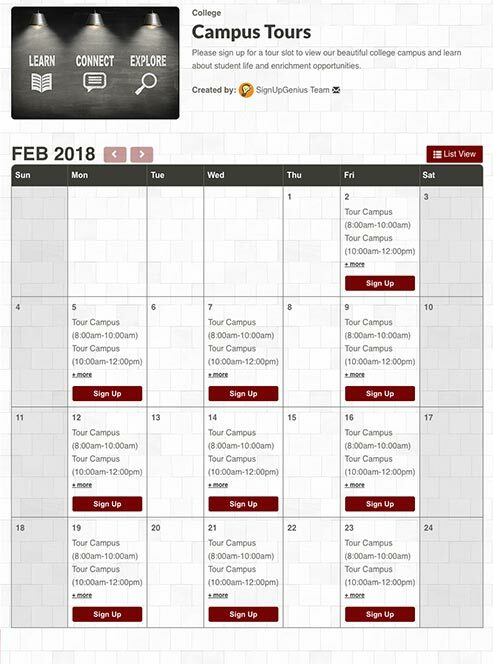 Schedule student tour guides and university information sessions. 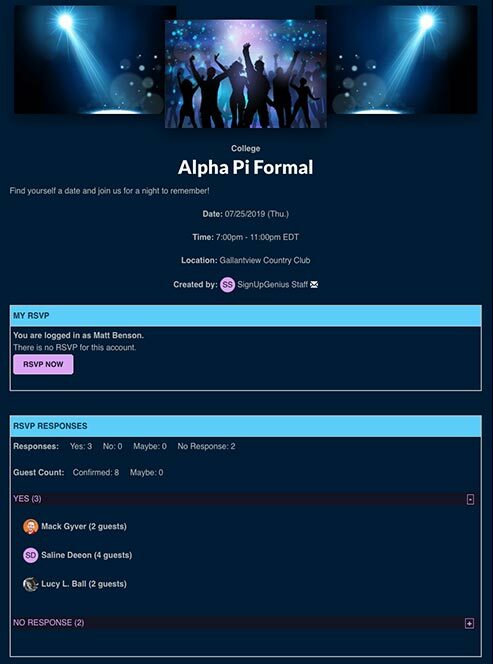 Plan Greek formal dances, fraternity and sorority mixers and rush events. 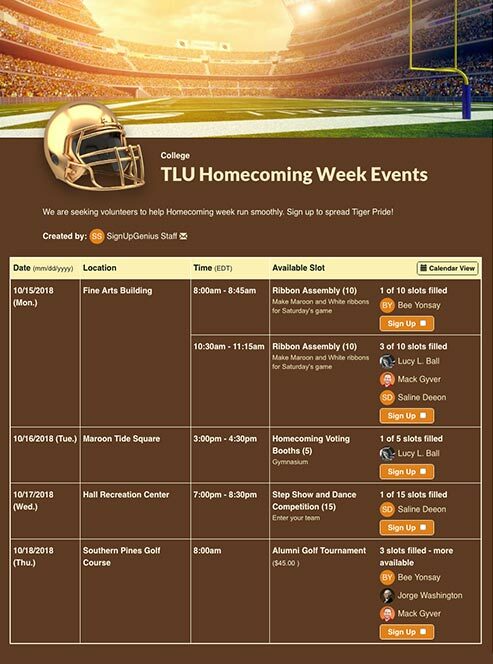 Organize Homecoming dances, service days, alumni reunions and football tailgating food. 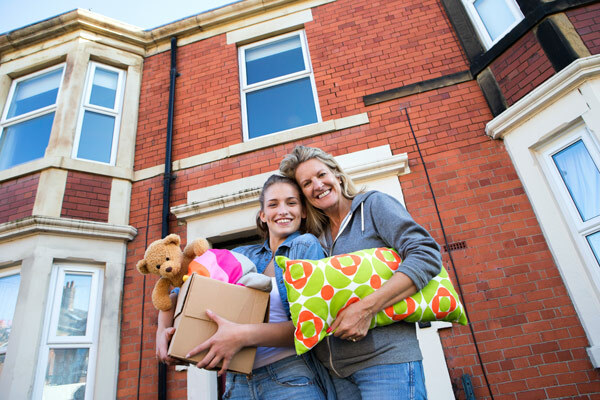 Pack for campus with this printable list of what to bring to college. 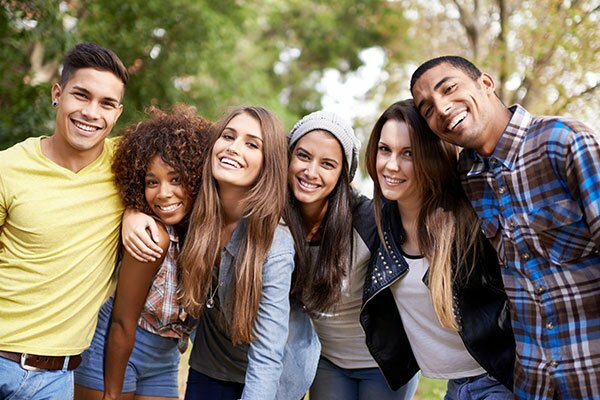 Find the best match and encourage roommate compatibility with these questions. Send thoughtful college care packages for exams, birthdays and special events with these ideas. 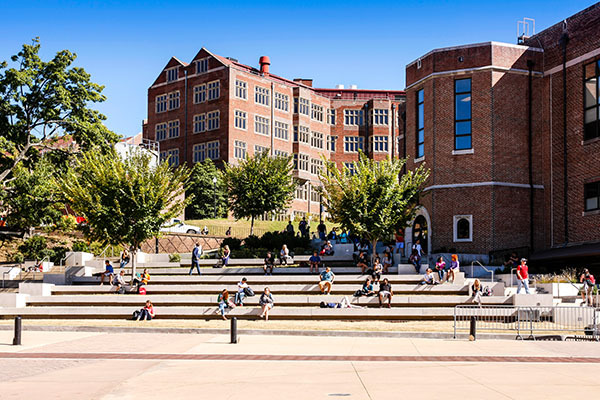 Start college like a pro with these tips for first year students on campus. Browse college icebreaker questions for conversation starters on campus. Prepare for your campus visit with questions and advice to make the most of your tour. 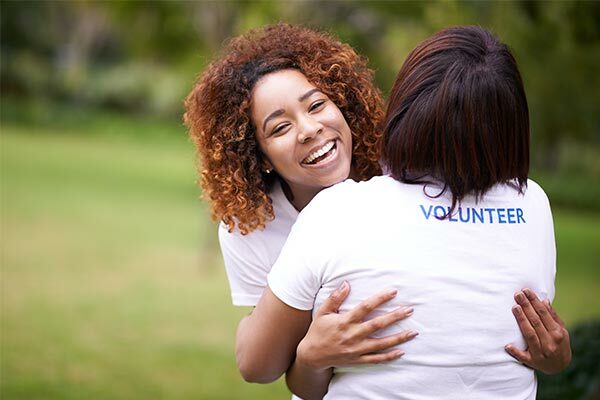 Make a difference on campus and in the community with these service projects. 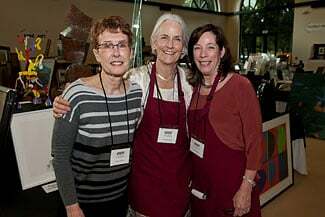 The Cantor Arts Center at Stanford University used SignUpGenius to organize 350 volunteer shifts for its annual Treasure Market, generating $250,000. "All the department chairs thought that I was such a techy person because everything they requested I was able to say, 'Yes, I can do it,'" said Ticket Sales Chair Janet Tang. "(SignUpGenius) was so easy to manage." Upload your university's logo or choose from hundreds of professional designs. SignUpGenius allowed my student organization to recruit and organize over 200 volunteers for a charitable event. An absolutely invaluable tool that we will continue to use for years to come. Thank you so much for a perfect site and service! Using SignUpGenius we can also keep a tab of how many volunteers we had participate in TEACH modules every year, and we can even organize the data by medical center (location) or date. Also, since we have many events at each location every year, we can duplicate an old sign up and simply adjust the date instead of creating another sign up from scratch! With more than 100 active members in our organization and nearly all of them paired with Little Jacks, you can see how amazing SignUpGenius is for us. Its simplicity, practicality and efficiency is what constantly has us coming back. Using SignUpGenius has allowed us more time to focus on other tasks rather than trying to facilitate scheduling and other factors related to hosting events. This platform has kept things organized and out of my email box - sending and finding emails for people can take too long, and this gives me master lists to work from and keeps records that I can refer back to.